The internet has allowed agencies to grow their offerings and created the digital marketing agency. It’s allowed businesses to grow their reach beyond just local markets and work globally. This lessens local competition and brings opportunities to work with brands we wouldn’t have the ability to do so with locally. While this opportunity is awesome, forgetting your local market is a huge miss that many marketing agencies are making. Here’s why missing local opportunities is hurting your potential. In my recent research of digital marketing agencies in the Twin Cities area, I noticed something strange. While they’re all based in the local area, very few were doing anything to rank well in local search. They may mention their location once or twice on their website, but few did much past that. A quick trip to the keyword planner reveals that while search volume is low for terms like “Minneapolis digital marketing agency” or “digital marketing agency St. Paul”, the competition for such keywords is high. This shows that agencies value the potential such searches bring their business, but there’s a lack of investment past a bit of paid search. Further investigation shows few have invested in local SEO, like Google My Business, Foursquare, Superpages, Citysearch, Acxiom, Yelp, and others. Atop that, local agencies almost never create content on their own sites that focuses on their connection with the area in which they’re based. While many of these companies have great local presence (offline) and are involved heavily in the area they’re based, they aren’t taking advantage of simple opportunities to connect themselves with their local community, boost their local SEO ranking, and cash in on local searches. We get why agencies want to go global. Why limit yourself to those businesses around you when you can be worldwide and have the potential to do work for the biggest names on the planet? But this focus on everywhere but where they are physically is a big miss. While every agency wants to think big and global, ignoring your own backyard is silly. In our global economy, we see big brands based everywhere. The Twin Cities area has brands like 3M, Target, UnitedHealth, Piper Jaffray, US Bank, Xcel Energy, Ecolab, and numerous other Fortune 500 companies right here. By ignoring local search, we may miss potential that someone searching at one of these massive local businesses doesn’t find your agency. Outside of big businesses, many others find potential agencies to work with through search and Google’s preference to return local results means those that do well in local rankings stand to see more traffic from anyone searching nearby. Work may be able to take place over the internet and via conference calls, but having the ability to meet in-person and have a face-to-face with your clients builds far better bonds with them (even if you don’t do it every meeting). The stronger relationship generally means more satisfied customers and local proximity allows the added ability of in-person meetings when clients need that extra attention. Neglecting these potential clients result in missed work and revenue opportunities. We want to think that those searching for an agency will look for the best option (no matter where they are), but we often start our searches in the area we know, which is close to home. My research in the Twin Cities area has shown there’s an easy opportunity to grab up local searches, and the same appears to be true in many other areas too. This is because few are playing in this space. With competition low, it wouldn’t take much work for any agency to come in and rank at the top of most local searches. Who wouldn’t want more targeted traffic to their agency website? Start by making sure you’ve covered the off-site local SEO spots mentioned above, such as Google My Business, Foursquare, and others. Tools like Moz Local, Yext, and others can help make this process easier. They’re relatively easy to take care of and don’t come with a cost to do so (other than a little bit of time). You’ll also want to make sure you’re listed with any local organizations your business is affiliated with. Many industry groups will link to member sites and you should also include links and information about the relationship on your own site. You may even want to consider joining local groups in order to reap the rewards of a backlink from their site, if it’s a good fit for your company. The cost of such memberships often offset the return from the link and recognition. Once you’ve taken care of the off-site spots, it’s time to turn your focus to your own site. You should be proud of where your business is based, so let people know. Include it in the copy on your site. Show others why being from your area gives you a unique ability to create great results for them. Add blog posts around topics that are relevant to your agency and work, but also tie into your local community. Talk about your company involvement in the local area and why being there is great for business. 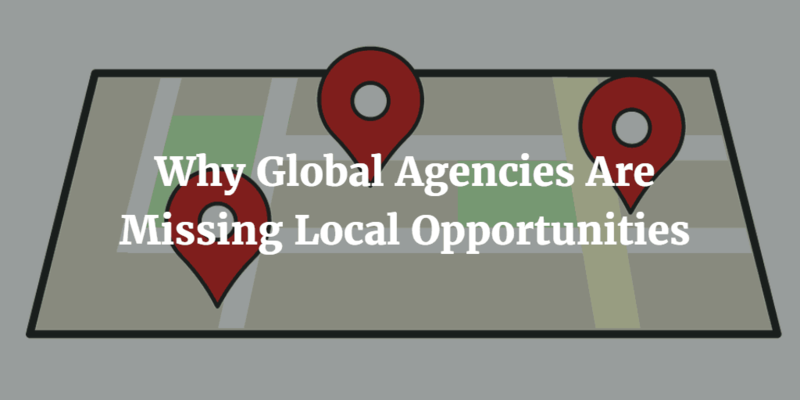 Many agencies are missing local opportunities because they’re too busy only looking to the global market. Local companies are a great way to build quick and strong relationships. They offer a wealth of customers who you share a common bond with and ignoring them is a huge oversight many agencies are making. By taking the time to infuse your site and local search signals with information around the location of your business, you can boost local search rankings and conquer the local competition. Take the time to show your site some local love. You’ll see great opportunities in return.